When Neurofeedback has been determined to be an option for treatment intervention, a treatment plan is designed for each individual taking into account their unique issues or problems and assessment data. Once we have reviewed your medical history, presenting symptoms, and present functioning, it may be suggested that further information is needed to be specific in what sites of the brain would best benefit from Neurofeedback. For this we may suggest a Quantitative EEG (qEEG). Quantitative EEG (qEEG) is a 19-channel recording of the electrical patterns occurring at the scalp surface. Maps of these electrical patterns, or brainwaves, are generated through digital measurement technology that sums the underlying cortical electrical activity into useable data. By mapping the brain with a qEEG it is possible to understand variations in brain structure and function that may be causing symptoms or problems in functioning. Conventional imaging technologies such as the CT, MRI or PET scans, do not capture all of the brain changes and abnormalities that may produce symptoms in an individual. For instance, EEG brainwave patterns may change when there is a brain injury causing microscopic tearing and shearing forces, yet this may not be apparent with other diagnostic tools. Additionally, a number of clinical syndromes, may result from injury or dysfunction to one or more brain areas. 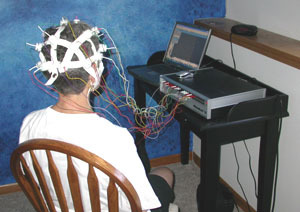 A qEEG helps focus Neurofeedback treatment to the correct brain areas requiring strengthening. The qEEG reading identifies abnormalities in electrical patterns of brainwave activity at a given site within the brain and also between areas of the brain. By looking at the relationships between functional areas of the brain, it is possible to identify problems the brain may be having in communicating between one functional area and another. Good working communication of neurons between areas of the brain makes for a better-functioning brain and one that is able to handle more complex tasks and perform in a more healthy and flexible manner. The individual’s unique brain map recording is compared to a normative database of subjects to determine which areas are functioning well and which areas may be functioning less than optimally. 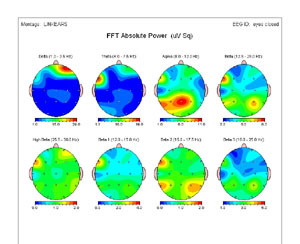 The qEEG is a useful adjunct when more detail is needed about problematic brain areas and when Neurofeedback protocols are designed for therapeutic intervention. qEEG is best used as an tool to aid in the clinical diagnosis of various dysfunctional states and not as a substitute for clinical judgment and medical opinion. A qEEG is very often used to supplement other medical, psychological and neuropsychological data to best aid the patient. We use a Mindset 24 along with Neuroguide software to graphically analyze qEEGs.